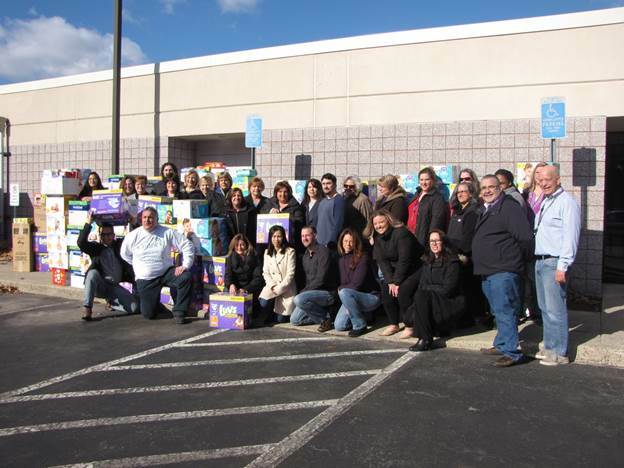 NORTH HAVEN, CT (March 14, 2017) — Connex Credit Union recently donated 45,018 diapers to the New Haven Diaper Bank, shattering the previous record for largest single contribution – 16,354 – which was also held by Connex. The credit union’s involvement stems from its sponsorship of the Shamrock & Roll 5K, a St. Patrick’s Day themed event benefitting the Diaper Bank, as part of its ConnexCares philanthropic program. Community donations made throughout February, combined with an internal competition inspiring employees to support the initiative, enabled the credit union to topple their initial goal of 20,000 diapers. After the completion of the Shamrock & Roll 5K on Sunday, Mar. 5, total donations reached approximately 50,000 diapers. The Diaper Bank is a local non-profit organization founded in 2004 to counteract the lack of public assistance poor and low-income families receive for purchasing diapers. The organization seeks to prevent the risk of health and parent complications caused by limited access to diapers. To learn more about ConnexCares and all of Connex’s charitable initiatives, please visit connexcu.org. Representatives of Connex Credit Union and the New Haven Diaper Bank pose next to a portion of the credit union’s record-shattering donation of more than 45,000 diapers. As the Unbank, Connex Credit Union is one of Connecticut’s largest credit unions serving more than 55,000 members at eight branches. Headquartered in North Haven, Connecticut, Connex is a full-service credit union that offers members a full-range of financial services and products. Membership is open to anyone who lives, works, attends school or worships in New Haven, Hartford, Middlesex or Fairfield counties. For more information, please call 1-800-CR-UNION or visit connexcu.org. ConnexCares is Connex Credit Union’s charitable and philanthropic program. The mission through ConnexCares is to promote financial literacy, well-being and understanding to our members and the greater communities Connex serves.